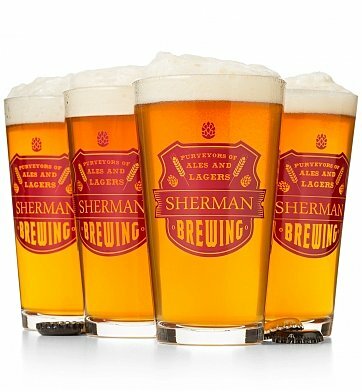 Four (4) Personalized Purveyors Pint Glasses. Purveyors of Ales Personalized Pint Glasses is a hand delivered gift. These gifts are delivered by one of our local design centers located throughout the United States and Canada. Same day delivery is available for most gifts when ordered before the cutoff time. The cutoff time for Purveyors of Ales Personalized Pint Glasses is 2 PM in the recipient's time zone. Four Tavern-Style Thick Glasses, Handmade in the USA.